B. Salvatore: Hi, my name is Bethany Salvatore and I, along with my colleague, Bryant Andrews, are labor and employment attorneys at Cozen O’Connor. We’re here today to talk with you about criminal background checks because we’ve received a number of questions from our clients such as, when can I conduct criminal background checks, how do I conduct criminal background checks, and how do I then use the information that I’ve gathered in a way that doesn’t expose my company to liability? B. Andrews: Some employers are voluntarily choosing to conduct criminal background checks as a normal part of the hiring process. That’s definitely okay. And then there are employers, like schools, nursing homes, long time health facilities to name a few, they’re actually mandated by law to conduct these checks. Criminal background checks are helpful in not only identifying applicants who might not be suitable for a job, but in limiting the potential liability associated with negligent hiring claims. Bethany, what are some ways that criminal history information can be appropriately used in the hiring process? B. Salvatore: That’s a great question, and I want to start out by saying that state laws vary on this issue. So if you find yourself as a multi-state employer, make sure that you understand the state laws that are applicable in any given hiring position. In Pennsylvania, by way of example, I’ve litigated a number of cases under the Pennsylvania Criminal History Record Information Act, which is the statute at play in Pennsylvania. 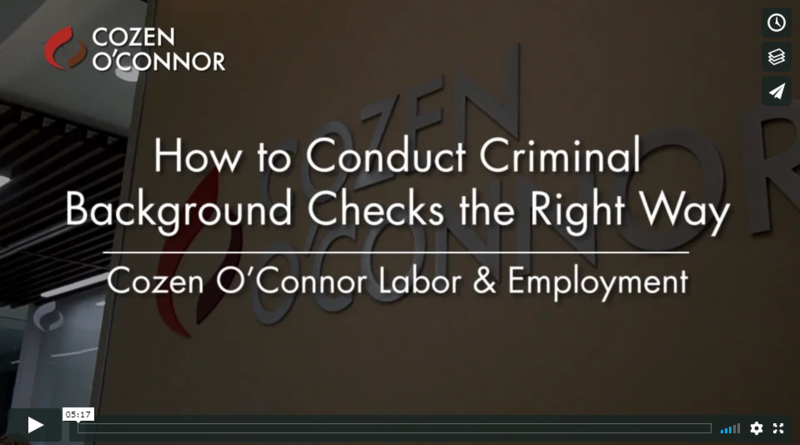 Under that state law, the employer is only permitted to inquire with respect to misdemeanor and felony convictions, not arrests. And only to the extent that those convictions relate to the suitability of the applicant’s job in question. So by way of example, in Pennsylvania, an applicant who is applying for a job as a hairdresser, that has a tax evasion conviction, most courts would find that would not be related to the individuals job in question. That said, if the individual was applying for a financial planner position, a tax evasion conviction would relate to the suitability of that individual’s employment. And that could be something that an employer would use in Pennsylvania. B. Salvatore: And one thing too I would say is making sure that, particularly with arrests, that you’re not running afoul of state and federal anti-discrimination laws. So statistically speaking, minorities have a higher arrest record rate, and therefore you run the risk of claims against your company. So that’s something else to keep in mind as far as not looking at the arrests, and also making sure that you’re asking the questions later in the hiring process. Hopefully after a conditional offer of employment has been made. B. Andrews: Right, no. I’m definitely glad you added that, that’s definitely true. So there’s a lot of information we’ve given you. So we’ll just leave you with a couple takeaways. First we encourage you to avoid any categorical exclusions for a conviction. You run the risk of not considering what kind of crime was committed, or how long ago it was convicted. We additionally encourage you to avoid looking at the arrest record. Again, it depends on what jurisdiction you’re in, but as a best practice erring on the side of caution, avoid those arrest records, look to the convictions alone. Finally, if you are to learn something at the end of hiring process when you’ve given the conditional offer that is alarming, instead of making any kind of final employment decisions right off the bat, we just encourage you to go back, interview the applicant and see, maybe the information you have received is not accurate or correct. There may be other issues at play. Before you make any kind of final decision though, definitely, we encourage you to consult your labor and employment counsel who know the ends and outs of this area of the law and can give you best guidance. B. Salvatore: Your challenge for you this month is to take a look at your criminal background check policies. Make sure they comply with the states in which you operate. And also stay tuned for our next episode where we’re going to be talking about the Fair Credit Reporting Act, and how that has interplay with not only the criminal background checks but other pre-hire inquiries that your company may face. So feel free to call us if needed. Our contact information is in the description below. We’d love to hear from you. And we hope to see you next time.